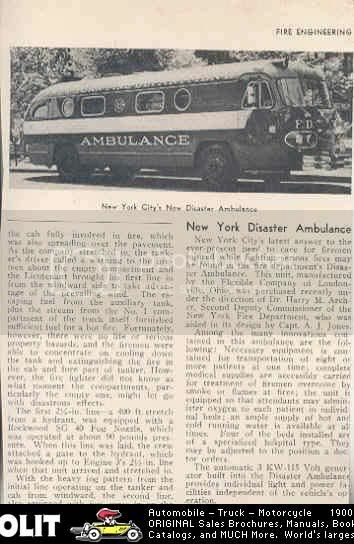 Does anyone have any information on the history of Ambulance 1 which was quartered with Engine 1/Ladder 24/Searchlight 21/Division 3 on 31st Street until about the late 1960's? I know that the last apparatus they used was a converted Carey Airport bus with about five beds. Any photos would be great. You might want to check out the book, Services Not Required, by Jack Calderone. It was also quartered at E-59 for a while and then became the Mobile Medical Unit, quartered at I believe 20 Truck. Thanks! And I just remembered that they was also a "bread truck" type that was either a spare rig or relpaced the Carey Bus. where do they sell it i searched faj and it didnt have it? It's been sold out for a number of years. Try Amazon, or E-bay. Here's an old, poor reproduction of a page from a 1950's era Fire Engineering showing the Flxible bus converted to Ambulance 1. (It was a Flxible, not a Cary . . . Cary Coach used a fleet of these for runs to the airports. Theirs were green with gold striping.). I've seen better, color photos of the rig, but can't seem to put my fingers on one right now. Will continue looking. Hope this helps. I know the book got some bad reviews because of several errors but the book "New York City Fire Trucks by Sorenson and Wood has a picture of the ambulance in question on page 102. The caption states that it could transport 6 patients on stretchers. It also carried 28 cots that could be used as a aid station, and had its own generator, sterilizer, oxygen supply, hot water tanks and heating pads. It could also hook up to outside power sources.